Children are ages 7 through 12; kids 6 and under enter for free. Advance tickets purchased by mail must be ordered by September 15 and will incur a $3 shipping and handling charge. After September 15, tickets will be sold downtown before and after parades and at the event location. On Friday, ticket cost is $5 for all school and scout groups with advance ticket purchases. Larger groups may be eligible for a group discount. 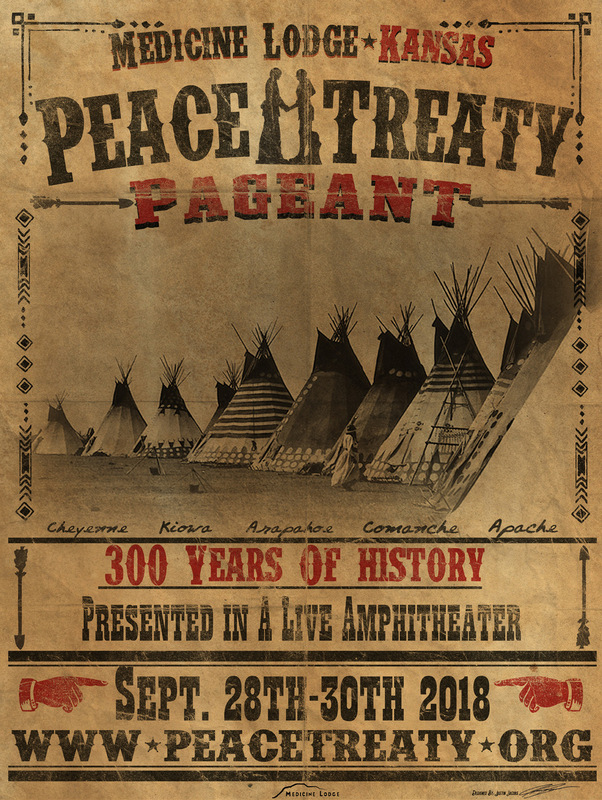 To inquire about group rates, or to order advanced tickets for school and scout groups, contact the Peace Treaty office at [email protected] or call 620.886.9815. Tickets are available from Select-A-Seat, but to order group tickets or mail your payment, print the ticket order form. Kids ages 5 through 17 can purchase an all access pass for $15 that includes three wristbands, one for each day of the Peace Treaty. Wristbands grant access to the downtown activities and also include a pageant ticket, powwow coupon, Stockade entry, Ranch Rodeo pass, pony rides and wagon rides. Each all-access pass includes the following. Forms have been distributed through local schools. 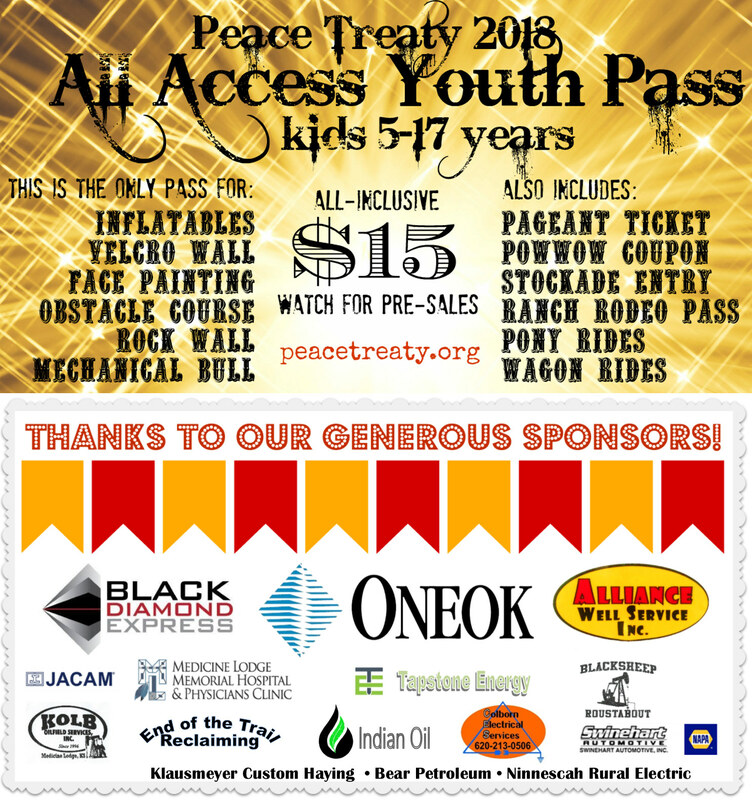 Passes will be available for sale during Peace Treaty on Main Street, at the pageant or at the Stockade. Youth tickets purchased through Select-a-Seat can be upgraded to an all-access pass at any ticket sales location. These passes, as well as pageant or rodeo adult tickets, are available via phone orders which will be mailed for a $3 fee. To order tickets by phone, call 620.886.9815 during office hours of 10 a.m. to noon and 1 p.m. to 4 p.m. on weekdays. Posters are available for $10 at the Peace Treaty Office at 103 East Washington in Medicine Lodge. Posters can be mailed for $10 shipping and handling. To order by mail, send $20 to the address below and make sure to include your return mailing address. Multiple posters can be ordered for the same shipping cost. View the complete list of events to plan your pageant experience.